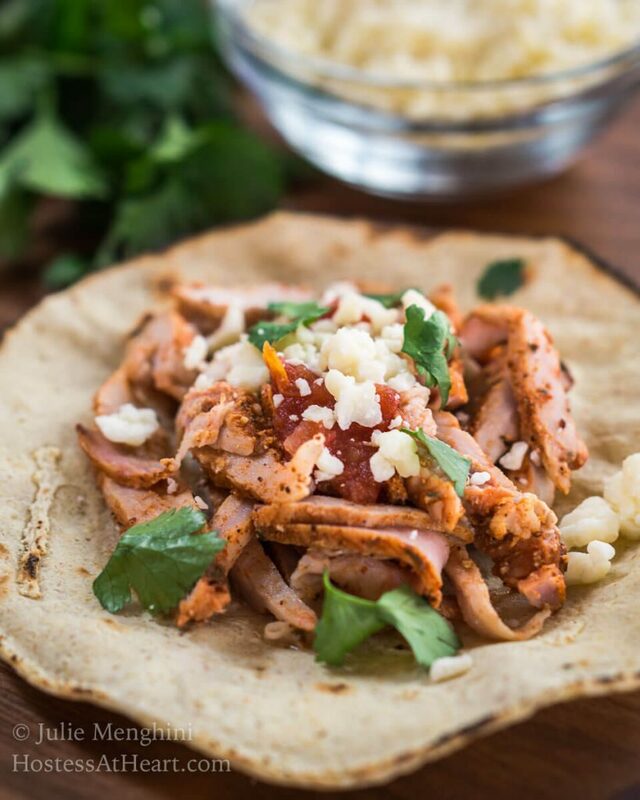 This Spicy Tacos Al Pastor recipe is perfect for serving a crowd. You can bake it in an oven or on the grill. It’s impressive to look at and even more delicious to eat. John and I love to make our Sunday dinners together. He is my grill guy and I’m usually his sous chef responsible for a side dish or salad. When he ran across a recipe for Tacos Al Pastor, we knew we had to give it a try. I’ve never heard of anyone that doesn’t like Mexican food. We all have our favorite style and John and I tend to enjoy the authentic recipes versus “Tex-Mex”. Especially if we can eat it in Mexico! We’ve been to different areas and love the culture and its people. 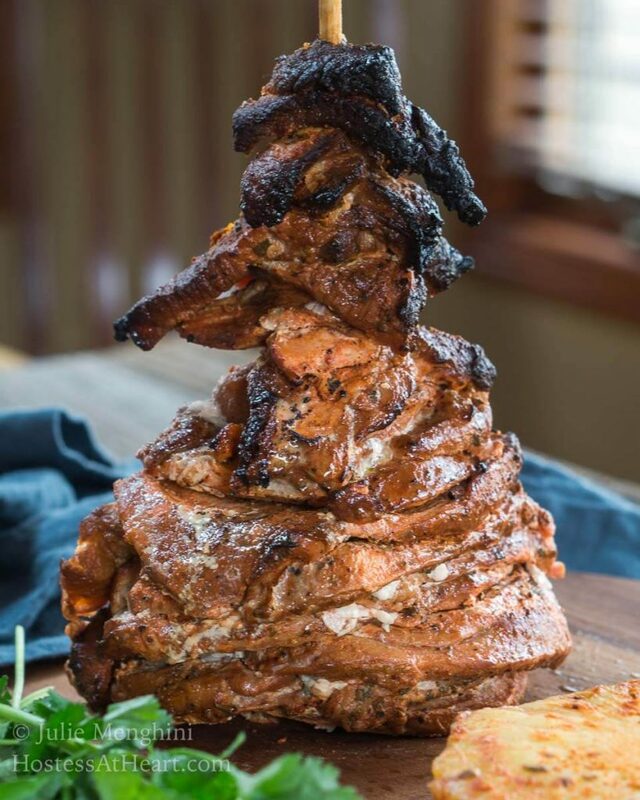 I don’t know how authentic this Spicy Tacos Al Pastor recipe is but it sure is delicious. The meat is marinated and so tender and flavorful. John chose to put it on the grill by setting it in a cast iron dutch oven. The meat was so lean that we didn’t get a lot of dripping. A skillet would have worked well too. I just loved the char that some of the meat got. John sliced it thin and we served it on corn tortillas topped with the simplest of toppings. We love celebrating Cinco de Mayo. Actually, it’s just an excuse to enjoy Mexican food and maybe a Margarita or two with our friends. I can’t wait to serve this one. The pictures may look impressive or a little intimidating like it was to me, but it’s a very simple recipe to make. I know my friends are going to love it! This Spicy Tacos Al Pastor recipe is perfect for serving a crowd. You can bake it in an oven or on the grill. It's impressive to see and even more delicious to eat. 1 thick wooden skewer or wooden dowel soaked in water 20 minutes. In a large glass bowl combine achiote paste with vinegar and stir until no large lumps exist. Stir in Guaillo powder, garlic powder, Mexican oregano, cumin, salt and pepper and pineapple juice. Add meat, cover and refrigerate at least 2 hours in the refrigerator. Skin the pineapple and slice into 1-inch rounds. Thread one pineapple round onto the wooden skewer and if baking in the oven, set it on a rimmed baking sheet covered with foil. You can also set it in a cast iron skillet or dutch oven and place it on the grill as we did. 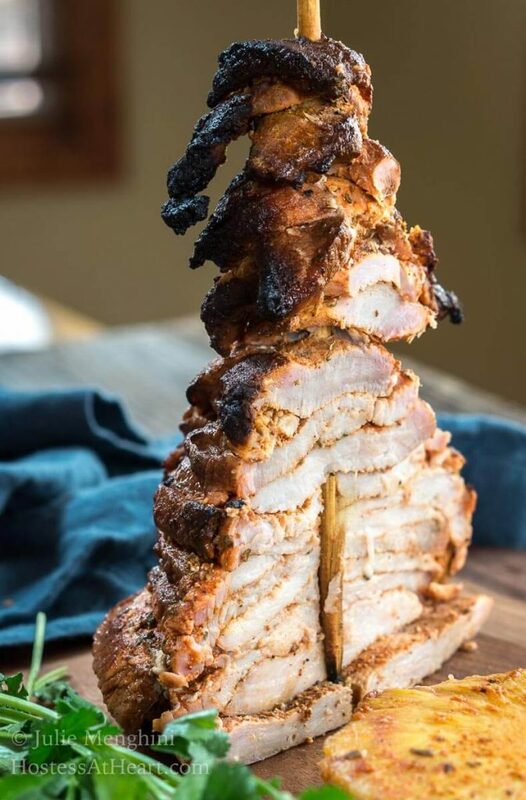 Layer slices of pork onto the skewer until 1 inch remains at the top. Place another slice of pineapple over the top. Preheat oven to 350°F oven for approximately 90 minutes or until the outside is slightly charred on the outside. Briefly grill remaining pineapple slices or bake for 15 minutes until they begin to brown. Remove the meat and let it rest for 10 minutes. Slice meat thinly. Assemble tacos and serve immediately. Prep time includes inactive marinating time. Nutritional information doesn't include whole pineapple or tortillas. Marvelous, Julie! It’s so lovely to think of two people cooking dinner together. Hugs. Thank you, sweet Teagan! Big hugs coming your way! This has always been on my bucket list of things to make! Maybe I’ll have the courage now that you’ve paved the way! Looks scrumptious. Thank you so much Molly! I was a little shy in taking this on too but it turned out so easy to do. 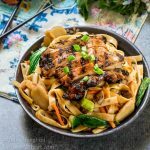 Spectacular recipe and photos Julie! The Mexican flavors are bold and spot on… Love it! Thank you, Tamara! It is so easy and yummy. Mexican food is my FAVORITE food in the WHOLE WIDE WORLD!! I need to get these in my tummy stat! Thank you Michaela! They’re on our menu this weekend again for a little Cinco gathering! I have seen this at many restaurants but never tried to make it this way home. So glad to know I can stick that on my grill and get going! What fun recipe for summer grilling too! Thanks Jennifer! It is kind of a showy thing and we were so happy with the way it tasted. You’ve definitely got my number. I love Mexican food. I cook it pretty much every week. 🙂 Definitely will have to try this recipe now! Thank you, Michelle! I crave Mexican food more than anything else! This looks amazing! And perfect for Taco Tuesday. 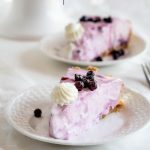 The pictures do look impressive but your recipe is very do-able! 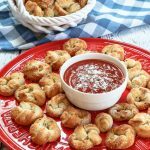 Perfect party food and perfect for a grilling night too – love this recipe! Thank you Debra! It was so much easier than I thought it would be. I was afraid it would topple over but the mighty pineapple did its job. Mmm this looks soo wonderful!!! This is the ultimate meal for entertaining! The presentation is awesome and those tacos look delicious! Thank you, Sandra! We’re repeating this one next Saturday and I can’t wait! 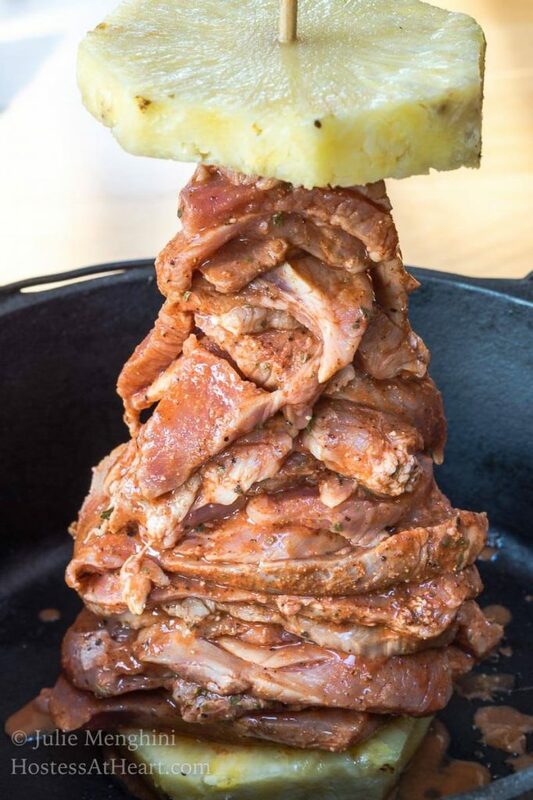 I’ve never heard of tacos al pastor, but I now need them in my life! They looks absolutely fabulous! Thank you, Lisa! I knew I loved them but never knew how they were prepared. So fun and yummy! These tacos look amazing! I adore Mexican foods, and I also love the creative way to grilled the meat. 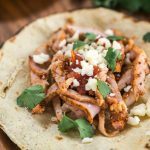 This is a fun and wonderful recipe to try any day of the year, but especially for Cinco de Mayo! Thank you, Debi! It was a lot of fun and we can’t wait to make this for our Cinco gathering next weekend! 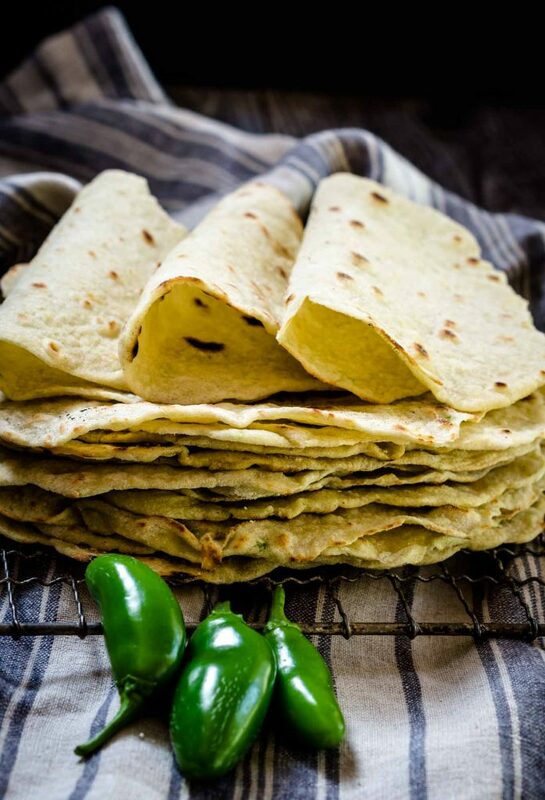 My husband has asked me so many time to make tacos al pastor… now I know I need to try these! He will be thrilled! Thank you Angela! I am actually making them again next weekend for a Cinco de Mayo get-together. Let me know what the hubs think. Thank you Angie! We really loved them and with John being my grill guy they were so easy for me! These look delicious, Julie! I love Cinco de Mayo and any chance to eat Mexican food! It’s def my favorite! Thank you, Ashlyn! I’m with you on Mexican food! Must eat all the tacos.These look SOOOOOOO good! Cannot wait to try them out! Thank you, Karly! I’m making them again for friends next weekend! Oh my gosh, my mouth is literally watering! 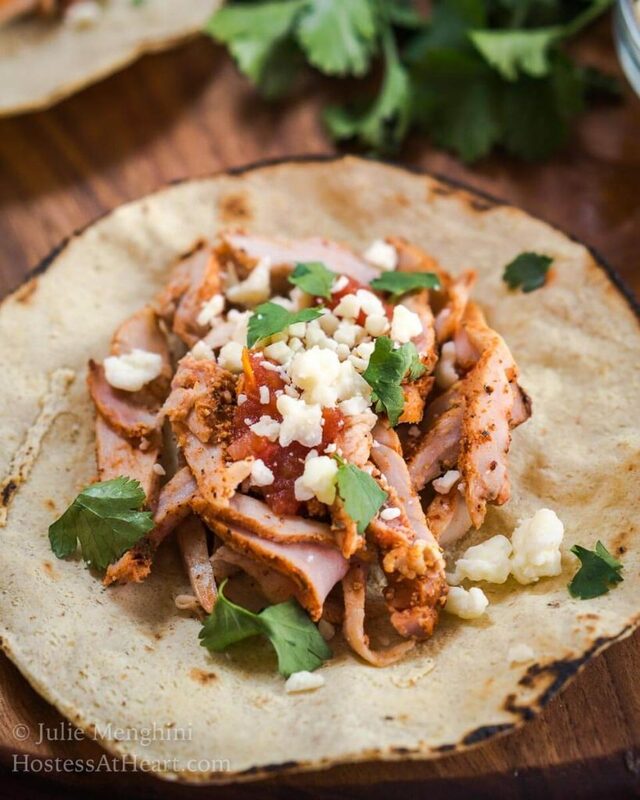 That pork looks so juicy and tender, I would just love some of these tacos right now! Thank you so much, Michelle! Just jump across that pond and we’ll whip some up with a couple margaritas of course! Tacos is the magic word — no matter what! 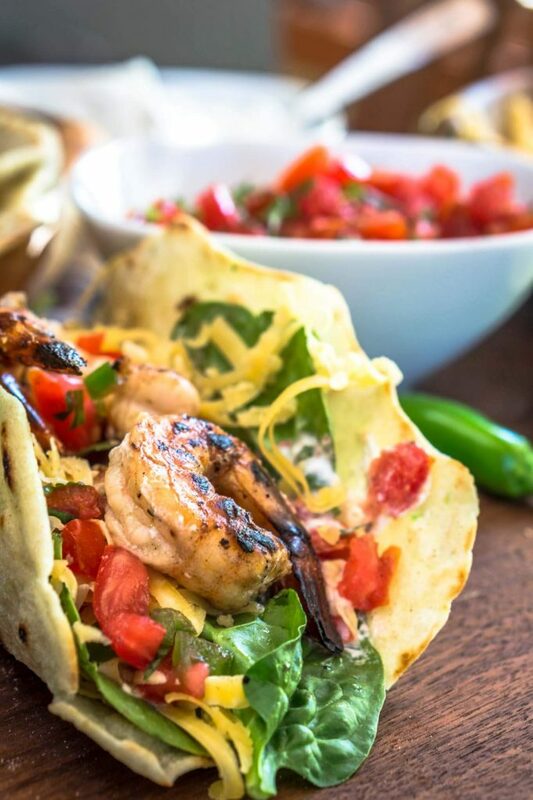 But… but… THESE TACOS?!?! Holy smokes!! I need to get these made stat! DELICIOUS! Thank you, Michaela! We were really happy with them and are making them again in another week. Love the way you grilled this Julie. Can’t wait to try your version! Thank you, Abbe! It was so good adding the amazing flavor you get from grilling. I hope you’ll let me know how it turns out! Omg Julie! This is so totally awesome…I am so glad you decided to try the recipe…the chicken looks so scrumptious..love the char on it. I always look forward to a good taco and this one surely is a show stopper..I love the use of the pineapple..Will have to try this for sure…Thanks for bringing this to Fiesta Friday #168. Thank you so much, Lina! I’ll be making this one again in a couple weeks for a Cinco de Mayo party and hope my guests love it as much as we did. I hope you enjoy FF and your weekend too! Thank you, Doreen! I really appreciate your kind comments on my photography too. It’s always a work in progress. These look so good! I love the way you grilled the meat, it looks so delicious! Thank you Meghan! I was not sure about this one but it was over the top. This would be great with chicken too. My son would just love this! Shared and following on Twitter! Thank you so much, Patricia! Returned the follow! So happy to have connected. I’d like a plate full! Please and thank you!!! Thank you, Lynn! Definitely a fav! This looks so good and I love the stack put in the oven. Great idea! Thank you, Caroline! I just love this recipe and the yummy leftovers. The Food Network Magazine had a lengthy quiz on what is Tex-Mex and what is authentic Mexican. These tacos and mole were the only two. 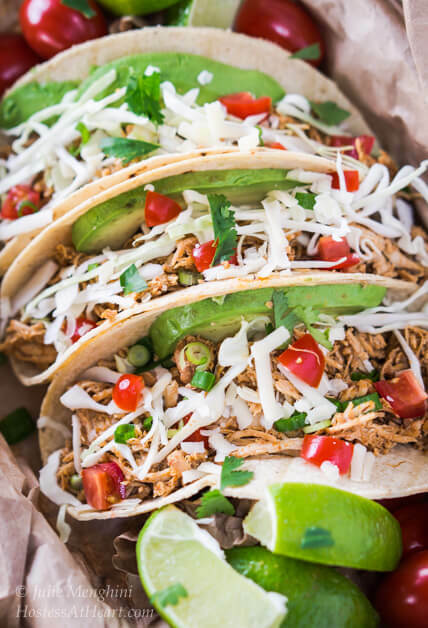 I never heard of these tacos but when a couple like you two cook together it’s got to be good 🙂 The recipe sounds authentic and looks delicious and it’s one you can make to your own taste! Thank you, Judi! I thought maybe John had outdone himself on this one Judi but we really had a good time putting it together and a great time snarfing it down! Wow! You and John are getting ahead of ourselves with the upcoming Mexican celebration eh? Margaritas? Yeah, sign me up, especially if you will be serving these unusual and tantalizing tacos. Love that 3rd picture with the pineapple, I’m sure the sweetness, tartness and heat took it a notch higher. Well done you two!! Thank you, Loretta! I don’t think I would have tackled this one but John had his eyes set on it. Turns out it was so much easier and tastier than I would have guessed so I had to share. It’s always so fun to create together too. Enjoy your day Loretta! We absolutely love Mexican food and this looks delicious. Thank you so much, Liz! Hope all is well and it’s wonderful to see you this evening! Beyond fabulous, Julie. Pinning for later! Thank you, Josette! I hope you’ll let me know what you think if you try it. Mexican food is my FAVORITE! Honestly, how could anyone not love it? These are some gorgeous tacos. Have a great week Julie! Thank you so much, Kelsie! 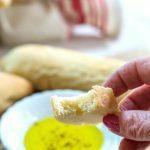 We absolutely loved this recipe and I’m making it again for a Cinco gathering we’re having. Thank you, Sonal! We really enjoyed it. Sometimes the flavor gets lost in tacos in my opinion but not these.